If you find rolling hoses from machinery to be too time-consuming, purchase a motorised hose reel and let the motor do the work for you. Not only will you have a safer working environment, but you will also be prolonging the life of your hoses and cables by properly storing them at the end of each use. You’ll have no more tangled hoses preventing you from completing your assigned task. 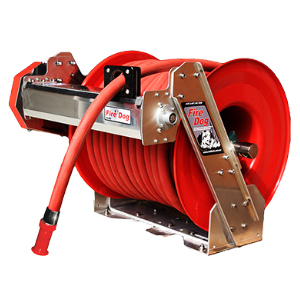 Reel Tech offers a vast selection of hose reels that provide a safe way to store your hoses and cables between uses. We specialise in hose and cable reel systems that increase productivity and prolong the life of hoses and cables. 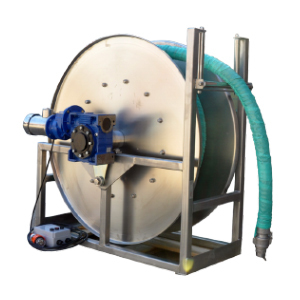 We are an exclusive distributor of Hannay hose and cable reels in Australia which boasts an extensive range of reel sizes available for your specific industry requirements. We work with a variety of industries including mining, paper and steel mills, food and beverage, pharmaceutical, maritime and military defence industries, including firefighting. We have designed and patented numerous reel designs and can custom build to suit your specific needs. Our extensive experience and knowledge offer you options for retracing and storing hoses and cables suited towards your industry. Proper storage of your hoses and cable offers them a longer life saving you money by decreasing replacement costs. Safety and efficiency are the most important reasons to utilise motorised reels. Hoses present hazards that are easily avoided by properly storing hoses when not in use. Manually rolling a hose is physically taxing. A motorised reel makes storage a breeze and eliminates tripping hazards protecting workers from unnecessary and costly injuries. Hose reels powered by motors increase productivity by making clean up easy. The motor retracts the hose quickly so workers can proceed on to the next task and leaving behind a safe area. Utilising an automated system to retract and store hoses saves money by allowing workers to focus on other tasks keeping product running smoothly and efficiently. Installing hose reels helps to keep your workplace safer by eliminating tripping hazards and saves time and money providing costs effectiveness. We can supply motorised options including spring, electric, pneumatic and hydraulic reels. Our experience affords you the right reel for your workplace, and our patented designs are designed to make work easier. 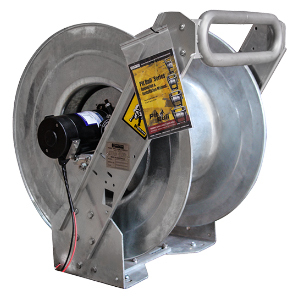 Our Fire Dog™ hose reels are designed exclusively for fire protection while our Pit Bull™ is designed specifically for mining operations. For grounds maintenance, our Reel Tuff™ automatic hose rewind and 12V requirements allow you to traverse a golf course and distribute weed control quickly and efficiently. Don’t trust your hoses to just any reel system. Invest in quality workmanship that provides proper storage for your work hoses and provides a safer environment for your workers by keeping hoses and cables off the floor when not in use. Contact us for more information on our vast selection of hose reels and customisation requirements to keep your operation running efficiently and safely.